Unique 7 in formula, magnesium citrate, vitamin E - without selenium, MSM, vegetable Omega 3 fatty acids (DHA and EPA), essential amino acids, pre- and probiotics and mycotoxin binding agents. Test packaging for the taste. Beware, it's about habituation! First mix a little bit with 'tasty' food and build it up quietly. 90% of the horses will eat it without problems. If you subsequently proceed to the online purchase of a starter package, you will receive a 4.5 euro discount. BASIC is a unique 7 in 1 formula. 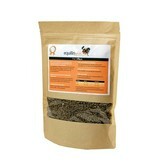 Having a healthy and sound (sports)horse starts with giving them proper nutrition. The main ingredients of BASIC are: magnesium citrate, vitamin E - without selenium, MSM, vegetable Omega 3 fatty acids (DHA and EPA), essential amino acids, pre- and probiotics and mycotoxin binding agents. Fact: all these ingredients are either not available at all or not sufficiently available in the ‘normal’ diet of the horse. As with anything, an engine cannot run properly when fed improperly and physical problems, including medical problems, will start developing sooner or later. Feeding BASIC replenishes these deficient ingredients in safe dosages. BASIC corrects the acidity of the intestines. The composition of EquilinBASIC is based on scientific research. The 7 in 1 formula of BASIC saves time and costs. 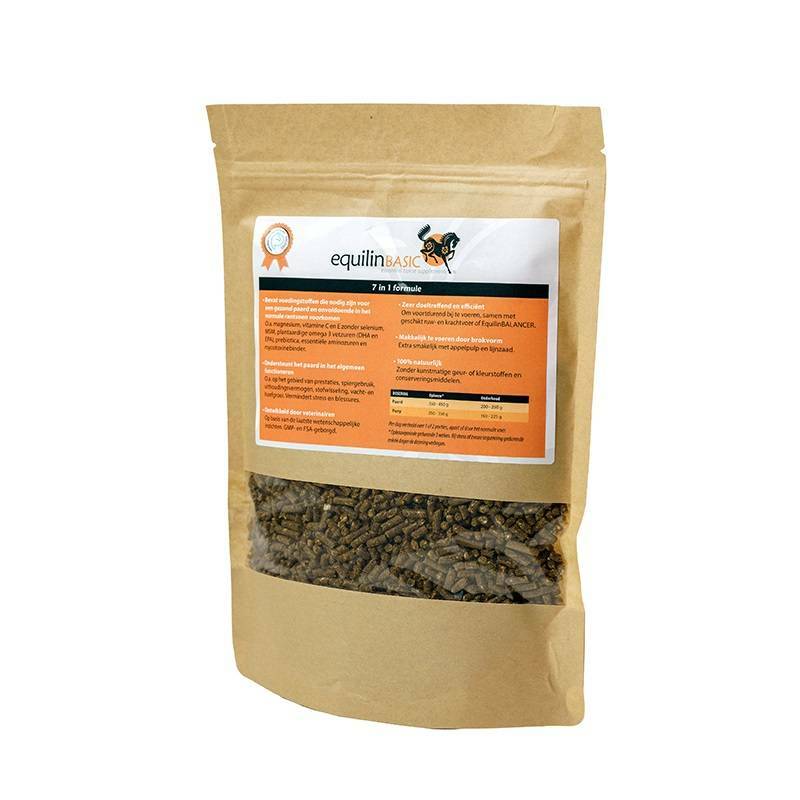 Instead of spending an average of £3.50 per day on a variety of (powder)supplements containing the separate ingredients, when using BASIC you are actually spending less than a third of that number and your horse will have 1 easy and palatable little pellet to digest. Most of the time, regular brands of ‘complete’ horse feed (forage as well as concentrates) do not contain what a horse really needs. Often these products also have an acidifying effect on the horses’ intestines. BASIC is intended for continuous feeding of the horse and is used in addition to suitable forage - hay or haylage. BASIC can be supplemented by the regular brands of cubes and/or mixes, and by EquilinBALANCER. Due to the unique 7 in 1 composition of BASIC, the effect of the combined ingredients is reinforced. In addition, less concentrates can be fed after a month as horses will become more energetic due to the fact that there is an improved absorption of the volatile fatty acids in the gut, originating from forage. BASIC is meant to be fed to your horse on a daily basis, in addition to good quality (preferably analysed) forage and possibly supplemented with a complete vitamin and mineral supplement OR 2.5 kg of hard feed. Please take into account that BASIC has to be fed a minimum of 6 weeks before results will be seen, after which the horse will improve further. However, in some horses the first changes can be noted as soon as after 3 to 5 weeks of use. Due to the higher loading dose during the first 3 weeks of using Basic, a regular sized (550kg) horse will need 2 bags to start. Hereafter it is one bag per month for an adult, regular sized horse. BASIC does not contain a complete vitamin- and minerals complex, therefore it can be fed next to any other diet. BASIC is FEI doping free. Side effects: Non known. Individual hypersensitivity to a specific ingredient can occur. Horses suffering from kidney failure can have problems with high blood levels of magnesium. Consult your veterinary surgeon before use. *Build-up dosage during 3 weeks. In case of stress or heavy exertion during a few days, increase the dosage to the build-up dosage. Composition: apple pulp, barley, linseed expeller, linseed fibers, dehydrated alfalfa meal, St. Johnsbread, apple molasses, sunflower oil, lecithin.